December will be a busy month at All Saints’. The Advent Carol service will be held on Sunday 3rd December at 6.30 pm. This is a beautiful service “from darkness to light” with music and readings for the season of Advent – do come and join us. The Toy service is on Sunday 10th December at 9.30 am. This is a parade service and everyone is encouraged to bring an unwrapped gift or voucher. These will be given to Welcare after the service for distribution to local children who might not otherwise receive any gifts at Christmas. The Community Carol service will be held on Tuesday 12th December at 7 pm. This service celebrates all the public and voluntary work in our community within a carol service. The service will be attended by the Mayor of Bromley and the collection will be given to the Mayor’s charities, the Bromley Homeless Shelter and Bromley and Croydon Women’s Aid. There will be some seasonal music from the children of Blenheim School as well as the Church choir. Everyone is very welcome to come to this service which will last about 50 minutes and be followed by refreshments in the church hall. The Traditional service of Nine Lessons and Carols is on Sunday 17th December at 6.30 pm, with readings telling the Christmas story and carols sung by the choir and the congregation. The collection will be given to Crisis, a charity working with the homeless. There will be mulled wine and mince pies in the hall following this service. In the week before Christmas (18th – 23rd December) Evening Prayer will be said in the Old Church at 5 pm using the special ‘O’ antiphons anticipating the birth of Christ. The service at All Saints’ church will be followed by an Act of Remembrance at Canadian Corner where 116 Commonwealth soldiers, who died of their injuries at Orpington hospital, are buried. We will also remember all civilians who have died in war at the grave of Ivy Millichamp, the last civilian to be killed in the Second World War. The advert for our new vicar is now on the diocesan website and will be appearing in the Church Times over the next fortnight. The parish profile is also now available on both the diocesan website and here – parish profile. Please contact the Parish Office with any queries. On Sunday 9th July we said our farewells to The Reverend Brian McHenry and Liz as Brian takes his well earned retirement. The Sunday morning service included hymns chosen by Brian and the choir sang the anthem “How Beautiful are thy Dwellings Fair” by Brahms. At the end of the service the Archdeacon , the very Reverend Paul Wright, blessed Brian and Liz as they prepare to move to Canterbury. Presentations to Brian and Liz included a photograph of All Saints’and a basket of flowers prepared by The St Michael’s Guild. There were also presentations from the youth groups at All Saints’ and the previous Sunday at the Parade service Brian had been given a 2nd Orpington sweatshirt by the scouts, cubs and beavers. The service was then followed by a Parish Lunch where 140 people had the chance to wish Brian and Liz well. A few photographs from the day can be seen under Gallery 2017. Profile of The Reverend Brian McHenry, who retired as All Saints’ vicar this month. We thank Brian for his dedication and service and wish him well for the future. I am a Londoner. I was born in 1950. Most of my life I have lived in south London . I went to school in Balham and at Dulwich College. I read Modern History at New College, Oxford. After taking my degree, I tried accountancy as a career. This was not a success and I then studied law and was called to the Bar in 1976. It was tough to make a living as a young barrister. I learned that the Government employed salaried lawyers, which attracted me. In 1978 I joined the Treasury Solicitor’s Department and went on to have a fulfilling and incredibly varied career as a government lawyer – court work, public inquiries, drafting legislation, advising the UK’s competition and consumer agencies and much more. The late 1970s were also very significant in my personal life, as I married Liz and we then had two sons, Tom and Joe, who are now grown-up. In 1980 I was elected to the General Synod and continued on it for most of the next 25 years. I served on several significant bodies, including the Archbishops’ Council. I have been an active member of the Church of England since childhood. I was licensed as a Reader in 1976 and have also been a Sunday school teacher. For many years I had a sense of being called to the priesthood. I finally allowed my vocation to be tested and the Church recommended that I should be trained. During my last few years as a lawyer, I attended the part time ordination course, SEITE. In 2008 I took early retirement from the Civil Service, was awarded the CBE for my public and voluntary service, was ordained a deacon and went to train as a curate at St Paul’s church, Deptford. In 2009, I was priested. Deptford was an exciting place to be, and it is there that I learned my new “trade” as a priest. As my end of my time in Deptford approached, I explored what God might next have in store for me. I met Archdeacon Paul (Archdeacon of Bromley and Bexley), who suggested that I might apply to become the Vicar of Orpington. I am delighted that I was appointed. I like to think that All Saints’ and Orpington feel the same! Being the Vicar here is very hard work but enormously rewarding and great fun. In the margins of my life, I love swimming, jogging, walking and travelling. I enjoy the house which we share in the Dordogne with my family. I read as widely as I can – mainly history, the great novels and classic detective fiction. I also follow the Arsenal! Members of All Saints who were confirmed on Sunday 25th June by the Bishop of Rochester. Orpington hospital was built by the Government of Ontario as a military hospital during the First World War for wounded Canadian soldiers and by 1919 over 26,000 soldiers had been treated. 182 soldiers (88 of them Canadian) are buried in “Canadian Corner” in All Saints’ churchyard. The Ontario coat of arms was displayed at the hospital until it was redeveloped in the 1970s.When Orpington Hospital was redeveloped the coat of arms were salvaged and have finally found a permanent home in All Saints’ church. They have been mounted on the North wall of the “old church”, close to the stained glass windows commerorating those who died in two world wars. The coat of arms were unveiled in their new position on 14th May 2017 by Alan Clarke, President of the Orpington branch of the Royal British Legion. The motto on the coat of arms, “Ut incepit Fidelis sic permanet” (Loyal she began, loyal she remains), refers to the loyalist refugees from the American Revolution who settled in Canada. The cross of Saint George is included as the name saint of king George III, in allegiance to whom they first came to the land that would form the province of Ontario. The coat of arms also includes three golden maple leaves representing Canada, a moose, a deer and a black bear. Angela Pentlow has made two altar frontals for the churches in the our link villages of Chitemo and Nyhinila in Tanzania. At present they have a simple table as an altar with only very worn table clothes. The Rev’d Yolande Marcussen will present the altar frontals on behalf of Angela when she visits in June. Yolande says that the churches have never possessed such accessories and she is sure the Pastor, his team and the congregation are going to be thrilled and that the gift will cause much celebration. Yolande will also take out prayer cups and bowls, made by Canon Gordon Oliver, as a gift for each church to be used for the administration of wine and wafers at Communion. We are very excited that Canon Gordon Oliver will lead our Lent Quiet day this year. 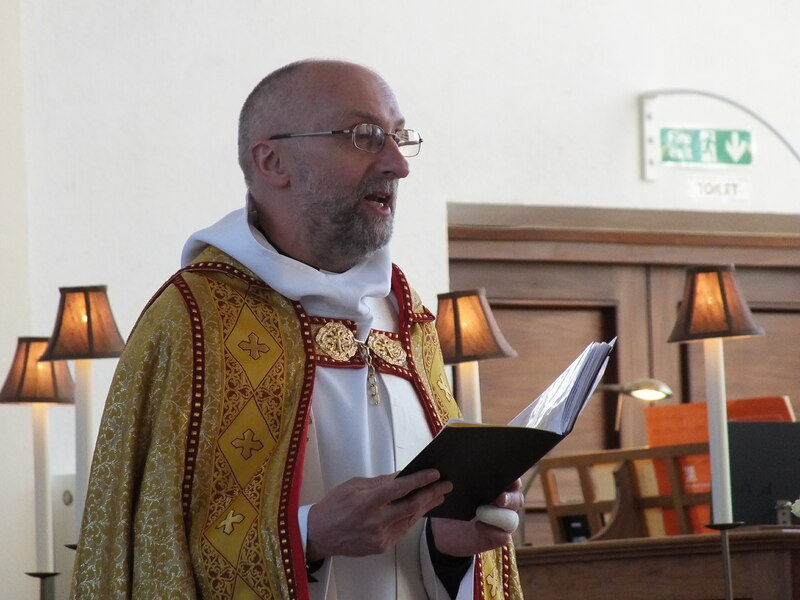 Gordon recently retired from full-time ministry as vicar of a dual-parish benefice where I was lucky enough to be sent on placement when I was training for ordination. During his many years as a priest Gordon has done many things including being a lecturer at Nottingham university, vicar of a mining community in the immediate aftermath of the Miners strike and being head of training for ministry for the diocese of Rochester. He is also a keen potter (you can find a photo of him with his potter’s wheel on the front page of the diocesan website) … he is threatening to bring clay! The day runs from 10am – 3:30pm in the Church. Coffee and tea will be available throughout the day and a bread-and-cheese-and-soup lunch will be provided. There is no charge for the day. Please do come and join for all or part. All are welcome. I have decided to retire in July of this year. I am now 66 and have been either a full time student or in work since I was 19. Here at All Saints’ I am now well into my 6th year. I feel that I have built what I felt called to build – in particular in our worship, in our outreach to the community, and in our ministry team. I now sense that God is calling me to move on; to whatever ministry He might have in mind for me and to devote more time to family and friends. I cannot begin to thank the parish for all that you have done for me and Liz. We feel so much a part of the family here and it has been a very hard decision to make. Liz and I are planning to move to the city of Canterbury. My last service will be the Dedication Festival Parish Eucharist on July 9th. Six years and two days after my institution. My Mum, Win, will be staying in Orpington for the time being, at her own wish. So she will continue to be the pianist for several groups here! We have an excellent team to run the church during the interregnum (the period between my departure and the arrival of a new Vicar sometime in 2018), not least a very able curate. There are all sorts of details to which we will attend before I leave, but rest assured that All Saints’ will always be in good hands.